The ProForm CrossWalk 300 Treadmill with Upper Body Workout Arms! On first look, you might wonder if the ProForm CrossWalk 300 treadmill is trying to be an elliptical. Upper body workout arms? This isn’t your traditional machine. But that’s not necessarily a good thing; you might want to think twice about having workout arms located on a treadmill which takes away from the notion of strengthening and balancing the stabilizer core muscles (abs, back) while using a free arm swing when you walk. UPDATE: The Crosswalk 300 is no longer available. To find a comparable treadmill check out the new full lineup from ProForm to see which model appeals to you. The ProForm CrossWalk 300 is an attractive treadmill but it’s run by a motor so weak you might be better off to catch a squirrel out in the yard and hooking the critter up to an exercise wheel to power this thing. We kid, of course, but not by much. Experts key in on that deceptive motor rating -- a 2.25 HP -- which means it’s a Peak horsepower unit, and not a Continuous horsepower (CHP) motor which is what you want in a treadmill. That, combined with the weak warranty gives the ProForm CrossWalk 300 a red flag warning. 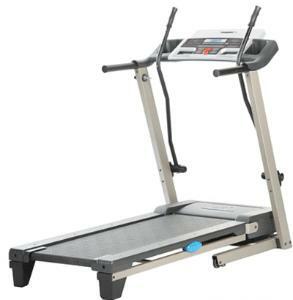 There aren’t many reviews done on this model by consumers, but we hope they are informed enough to see that this ProForm model has other weak features besides the motor and warranty: the tread belt is narrow and short, the max user weight is too light, and the CrossWalk 300 doesn’t offer more than 6 workout programs. The upper body workout arms aren’t needed either -- just grab a pair of 2 lb hand weights and pump those while walking on a treadmill. 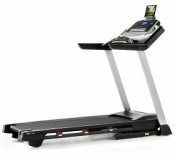 The ProForm CrossWalk 300 treadmill does offer some innovative cushioning thanks to a thicker belt that reduces joint impact up to 22%. But there’s not much else to cheer about. The drawbacks are too obvious: the 5 year motor warranty is too short, there’s a lack of workouts, and of course, the unnecessary arm handles. For the same price, you’re better off with Proform’s new 5.5 CrossTrainer treadmill which offers 24 workouts, a larger belt, heavier user weight, and a 12 year motor warranty. You should also see the Proform 5.0 -- which does include a pair of hand weights!